Our last post on Queen Margrethe's big 70th birthday celebrations features events from the Queen's actual birthday, April 16th. Which jewels are your favorites? 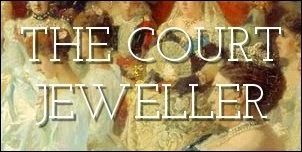 During the daytime events, the Queen wore a piece of jewelry that is among the most sentimental items in her personal collection: her diamond daisy brooch. The piece was a present from her mother, Queen Ingrid; it's made out of diamonds that belonged to Ingrid's mother, Crown Princess Margareta of Sweden. Read more about the piece here! She paired the brooch with pearls and earrings from her turquoise collection. Royals gathered at Copenhagen's city hall for a reception. Instead of brooches, Margrethe's daughters-in-law both wore the new commemorative medals they received in honor of the Queen's birthday. Marie paired her medal with pearl drop earrings. Queen Silvia of Sweden was elegant in pearls at the daytime reception. She also wore a large brooch from her personal jewel collection, made of diamonds set in yellow gold, with several pink stones attached as pendants. Crown Princess Mette-Marit of Norway accessorized with a be-ribboned headpiece. Maxima of the Netherlands, then still a princess, wore gray pearls with all of the plaid in her closet. Beatrix of the Netherlands, then still a queen, wore pearls. In the background, you can glimpse Constantine and Anne-Marie of Greece; as members of the extended Danish royal family, they're also wearing commemorative birthday medals. I believe Anne-Marie is also wearing the same sapphire brooch she wore at Charles and Camilla's wedding blessing. That evening, a dinner was held in the Queen's honor at Fredensborg. The gala event was black tie -- some royal ladies wore tiaras, and others did not. Queen Margrethe, though, went with major diamonds, including her mother's Floral Aigrette Tiara. Crown Princess Mary wore the full Midnight Parure -- tiara, earrings, and brooch. 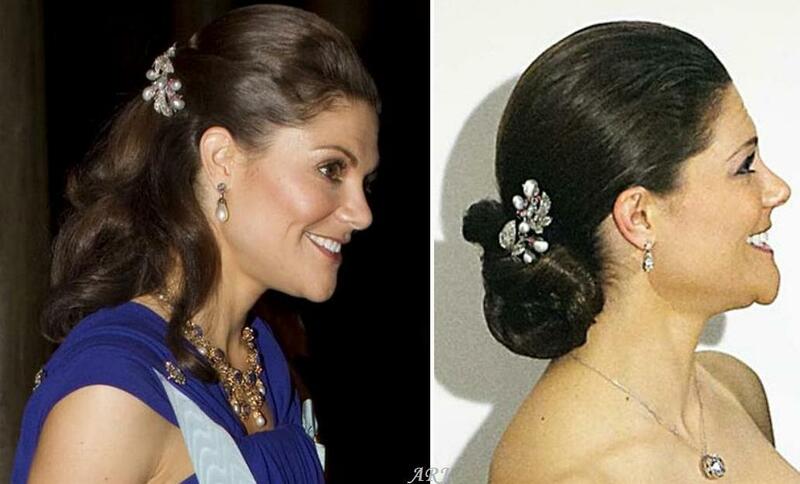 Princess Marie wore Princess Dagmar's Floral Tiara with an elegant pair of diamond earrings. Princess Benedikte wore the Sayn-Wittgenstein-Berleburg Fringe Tiara with her amethysts. Benedikte's younger daughter, Nathalie of Sayn-Wittgenstein-Berleburg, borrowed her mother's Floral Birthday Tiara, wearing it with an interesting pendant. Carina Axelsson, partner of Benedikte's son, Gustav, wore the same diamond tiara she'd worn during the previous evening's gala. Queen Anne-Marie of Greece, younger sister of the Danish queen, brought an important tiara back to Denmark for the gala: the Khedive of Egypt Tiara. (Read a timeline of this tiara's history here!) She inherited the piece, which is the Danish royal family's heirloom wedding tiara, from her mother, Queen Ingrid. She paired the tiara at this gala with pieces from the Greek royal family's gorgeous ruby parure. Anne-Marie's elder daughter, Alexia, wore her usual diamond tiara. At the waist of her gown, though, she's also pinned a sentimental piece of family jewelry: Queen Alexandrine's diamond and ruby bow brooch, which given to Alexia by her grandmother, Queen Ingrid. And on her left wrist, you can see a glimpse of her simple gold bracelet, a Danish royal tradition. Queen Silvia of Sweden made a rare outing in her modern fringe tiara, worn more often these days by Princess Madeleine. It's a little difficult to see, but Crown Princess Mette-Marit of Norway has her diamond daisy bandeau nestled in her hair. Queen Beatrix of the Netherlands wore rubies, including the family's Ruby Peacock Tiara. Princess Maxima went with the smaller of the Dutch royal sapphire tiaras -- the converted necklace tiara from the sapphire parure. This was one of the last major royal gatherings before a series of abdications shuffled the deck, and the then-heirs -- Willem-Alexander of the Netherlands, Haakon of Norway, Victoria of Sweden, and Frederik of Denmark -- all posed together for a "next generation" picture. Since then, Willem-Alexander has become king. One of my favorite Luxembourgish royal tiaras, the Vine Leaves Tiara, made an appearance on Grand Duchess Maria Teresa. She also wore a gorgeous diamond floral brooch and pearls. One more Scandinavian royal tiara from the event: the pearl and diamond aigrette tiara worn by Countess Gunilla Bernadotte. Gunilla is the wife of Queen Margrethe's maternal uncle, Carl-Johan, who died in 2012. He was born a Swedish prince, but after he married a commoner, he was granted the title "Count Bernadotte of Wisborg" by his distant cousin, the Grand Duchess of Luxembourg.